These explosive moves can help you build stronger, denser muscle, capable of doing more work. In this industry, we hear it all the time – mostly from physique-conscious athletes who have been training a certain way for a long time. They say that plyometrics are for “other guys,” and that they’re only concerned with exercises that affect muscle growth and/or fat loss. But this mentality is quickly dispatched once they are put through even the most minimalist of plyometric routines. It is soon realized that even the lightest infusion of plyometric training can enhance strength and muscle quality while drastically accelerating fat-burning. Look at a sprinter’s physique. Training explosively challenges the high-threshold motor units – the nerves and muscles that are the body’s biggest, fastest, and strongest and also the most prone to hypertrophy. The body only calls on these when the demand requires it. Moving rapidly also sends a powerful hormonal trigger to the body to carry less ballast (read: body fat). If you need to move rapidly, every bit of your mass had better have a purpose so your body starts getting leaner to get faster. The body, quite literally, is triggered to become a lean, mean, speed machine. 1 Plyos target the fibers that you want targeted. Type II muscle fibers – the ones most inclined to hypertrophy, produce high amounts of force, and fatigue more rapidly. We have these fibers all over our body, not just in the legs. Performing plyometrics with the upper body, lower body, and core muscles provides a complete plyometric training experience. 2 Plyos boost performance on other key lifts. When you jump, you accelerate out of and through the bottom part of the range of motion of a squat. This explosiveness helps build strength in the most challenging parts of a lift. For example, on a heavier squat, the hardest part is getting out of the bottom. Developing a powerful neuromuscular response of the body in that bottom position helps with strength. Strength and speed have different characteristics but they are generated by the same muscles and nerves. Similar results can be expected on the bench press from the inclusion of plyometric push-up variations. 3 You don’t have to do them exclusively – you can do plyos as part of your existing routine. For newer exercisers, it is best to train strength and power as discrete, separate training sessions. For intermediate to advanced exercisers, there is no harm in combining plyometrics and strength into the same session. 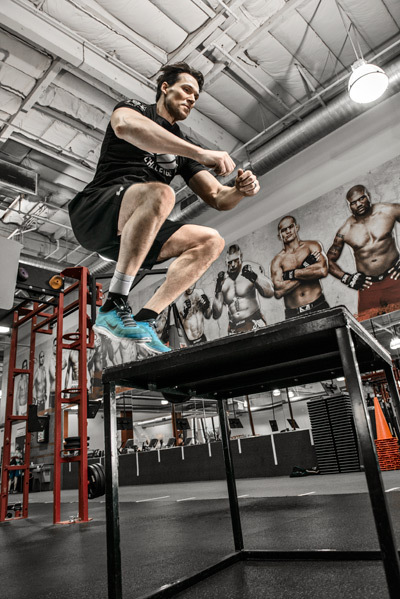 When doing so, in my experience, it is better to perform plyometrics first, as the speed of movement requires a fresher more responsive nervous system more so than slower, strength movements. Additionally, strength training will typically induce more muscular damage at the cellular level from the external load. As long as you avoid a high volume of high-intensity plyometric exercises, performing them prior to strength training can be beneficial due to the increased nervous system excitability.